This season of The Walking Dead has been going strong. With some wonderful performances and scenes that feel ripped right from the pages of Kirkman’s comic series, this season of the Walking Dead has come to prove what this series is capable of. “Hounded” however, came off as a different breed of animal. While I did not find it to be as poor as “Killer Within”, this weeks episode felt out of place- a middle man of sorts- and ultimately felt like a brief introduction into the second half of this already halved season, the remaining eight episode airing in the new year. At the end of last week’s episode viewers were left with a strange scenario- Rick receiving a phonecall. I particularly love this moment in the comic books, and feared that the writers would drag this event out for a few episodes to create more suspense. Luckily they didn’t, and the possible excitement of meeting new survivors dissipated into something far more dreadful. Once again Andrew Lincoln had a wonderful performance in this episode, showing his excitement of someone being able to help them, to the sheer depression that hit him once he realised that he was talking not only to his dead wife Lori, but all those that he has seen die in the series. It was a nice added touch to include Jim, Jacqui and Amy, though I wish they would have included Sophia, after all he failed to find her and did have to shoot the poor girl last season. Also why no T-Dog? I mean his death is more recent and yet even now characters like Jim, who was in the series for like five episodes in the first season and did not even have that big of a role, gets a quick mention. Why writers why? Never the less these scenes turned out really well, showing that perhaps Rick is not the most mentally stable of the group, but still has obligations to his friends and above all else, his family. As Rick continued to fall into madness, Andrea unfortunately fell into the hands of the Governor. While this was not completely unexpected, the way in which they went about had a glimmer of hope, but then quickly disappeared. Of all the character changes from the comic books, Andrea’s transformation is the most disappointing. While viewers did see a peak at the darker side of Andrea when she hoped over the wall and killed the walker, or when she came to confess her enjoyment of the arena battle, this came to be downplayed by some very poor innuendos and foreplay between her and the Governor. While I at first thought it would be interesting to see Andrea become attached and subsequently forced to move away from the Governor once she discovered what type of man he is, the way the writers are going about it is just plain silly. Hopefully this pair comes to split apart and quick. Although Andrea and the Governor’s story fell flat, it was interesting to see Merle play a twisted version of cat and mouse with Michonne. I mean how awesome was the message she left for Merle and his guys to “Go Back”, or when the hunter became the hunted as she dropped from the trees and takes two of Merle’s guys out, before disappearing again. This sequence was great and came to demon state how Michonne has survived so long in the wild. That being said, it felt off when Michonne did not clue in as to why the walkers could not smell her. I mean was that not the reason why she kept those two walkers on chains around for so long, plus we just saw how great a hunter she is in the previous scenes. And yet she did not realize that she could mask her scent by using bits of walkers- come on! As previously mentioned this episode felt a way to get the ball rolling so to speak, and did it ever show in Maggie and Glenn’s brief story, as well as Meryl’s. First off Glenn and Maggie’s whole run to grab supplies was just dumb, and simply a way for them to conveniently meet Merle, who was still on the hunt for Michonne. However, now that they have been kidnapped by Merle and brought to the Governor, it will be interesting to see what exactly occurs to them. In the comics, this leads to some very messy interrogation sequences that happen to Rick, Michonne and Glenn, who comes to break down. Now instead it will be Maggie, his loved one, who is there instead, which leads me to wonder how grim Glenn’s near future will become. After weeks of so called suspense viewers were finally rewarded with the discovery of, you guessed it, Carol. 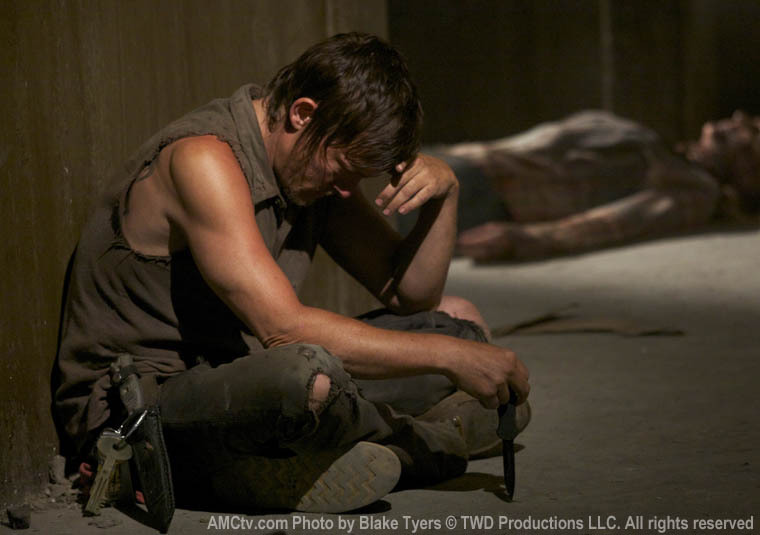 While it was a heart warming moment to see Daryl, a sheer loveable badass, pick up Carol and carry her back to the cells, it was utterly infuriating that not only did it take this long to find her, but also that even after all this searching he fails to find her in the first ten minutes of the episode when he decides to not search the one closed and banging door. What the hell writers, that is just stupid. We know how awesome of a detective Daryl can be, and yet to take away a key element of his character, much as they did with Michonne, just for the sake of creating even more unneeded suspense is beyond dumb. Hopefully, Carol’s discovery is not all for naught and that maybe we come to see an actual relationship emerge between these two characters, because let’s be honest after everything Daryl has done for Carol, she owes him a thing or two. While “Hounded” was by no means a disaster, it simply felt like an episode meant to get the ball rolling again. Hopefully, this does not persists in the remaining two episodes before the mid-season break, and that hopefully some characters come to their senses- I’m looking at you Andrea.